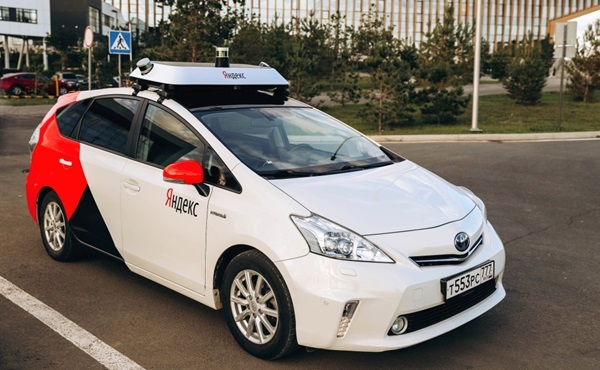 Entries from Digital Intelligence tagged with "yandex"
Russian search engine Yandex has launched a number of AI-powered services as it looks to rival Google in the mobile search market. Russian Internet giant Yandex has launched the new version of its Chromium-based browser offering a twist on the traditional format. Russia’s most popular search engine Yandex has asked the state anti-monopoly watchdog to investigate Google for possibly violating Russian antitrust law. Russia’s largest search engine, Yandex, has struck a real-time bidding (RTB) partnership with Google, granting its ad clients access to Google’s DoubleClick AdExchange. Facebook has struck a deal with Russian web giant Yandex, that will see its visitors served relevant real-time public posts from Facebook alongside their usual search results. Yandex is now offering online stores a new model for listing their products onYandex.Market, as the Russian internet giant looks to boost its ecommerce tools. Ilya Segalovich, the co-founder of Russia’s largest search engine Yandex, has died at the age of 48. Yandex has revamped its personalised search, tailoring results around each user’s short-term and long-term interests, providing new channel for brands’ search marketing techniques in the process. Yandex. Pesonalised Search Results from Yandex on Vimeo. New developments at Yandex unlock new approaches for search engine marketing in Russia. Their redesigned results pages unlock new digital marketing techniques for brands as new “snippets” allow results to be more deeply integrated. No Man Is An Island from Yandex on Vimeo. Mail.ru is the largest free email service in Russia and leads in terms of visits and average time spent on the site. 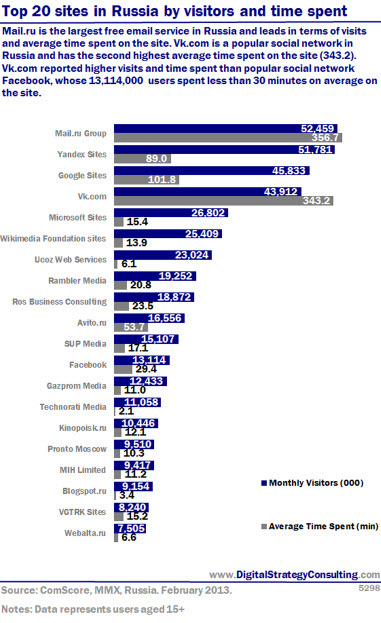 Vk.com is a popular social network in Russia and has the second highest average time spent on the site (343.2). 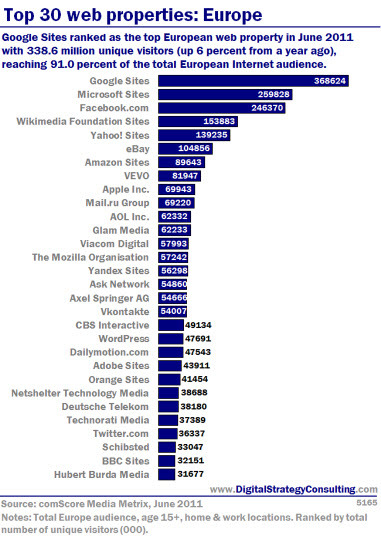 Vk.com reported higher vists and time spent than popular social network Facebook, whose 13,114,000 Russian users spent less than 30 minutes on average on the site during February 2013. Mail.Ru, Yandex, Google and VK are the most visited sites in Russia, but it’s the social networks that get most screen time, according to new data from ComScore. Russia is the sixth largest country in the world in terms of internet users, overtaking the UK, Indonesia and Germany in recent years. Despite this, there remains huge scope for growth. This infographic looks at the key digital players in the country, across social, mobile, email, search and video sectors. The infographic below is an open source project from IAB Russia, inviting comments for further additions. 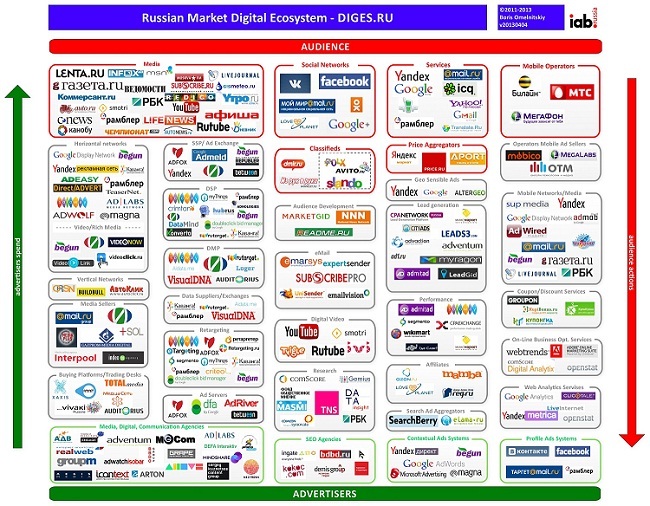 The map describes the key sectors, processes and players in the field of digital marketing in Russia. As consumers become more savvy and demanding when it comes to online ads, with content marketing growing in importance as a result. This infographic from Content Amp looks at the key technology suppliers and platforms in content marketing, which covers everything from analytics to content generation and SEO to social. Russian search giant Yandex has updated its Advertising Network with images added to its contextual ads in a bid to improve click through rates. Russian internet giant Yandex is to remove its recently-launched app Wonder from the US App Store following Facebook’s block on its API access. Lanched on January 24th, Wonder was Yandex’s first US-only product, but Facebook started blocking all API calls from the app just hours after it went live. Yandex has launched its own Internet browser, as the search giant looks to take on Google in the growing Russian market.The browser offers a relatively minimalist Russian-language interface based on the WebKit platform and Google's Chromium code. Hotmail remains the most used web-based email service across Europe, but Gmail, Yahoo and Mail.ru are catching fast, according to new research. The study, from comScore, looked at internet usage in Europe during June 2012, showing that 397.2 million Europeans went online for an average of 25.9 hours. Industry themes we're tracking this month? The importance of innovation in your strategy: build it or buy it? Instagram's $1bn price tag makes sense for Facebook's 'buy' strategy because it blocked Twitter, Google, Apple or MSN from leaping ahead. In cloud storage, the trend seems to be to 'build' your own: April saw Google unveil a cloud storage service to undercut Dropbox, SkyDrive and iCloud. Our money is on Dropbox getting bought soon, as late entrants realise 'buy' will be the only option left. This month's Digital Intelligence includes data on: top Facebook brands in the UK, Asia overtaking the west for online video, China's internet growth, and which days of the week work best on social. As always full stories at the end of the click, and a great video of Google's 'goggles' - the planned augmented reality glasses straight from a sci-fi film. The co-founder of Russia's Yandex search engine has claimed Google is 'semi-open', criticising its Android smartphone platform and Chrome web browser. Speaking to the Guardian Ilya Segalovich Yandex co-founder described Android, as a "strange combination of openness and not openness" and its Chrome web browser as anti-competitive. Russian search giant Yandex has struck a deal with Twitter, giving searchers immediate access to as many as 250 million daily tweets. Twitter will license "the full feed of all public tweets" to the search engine, with new tweets becoming available in search results "in a matter of moments," Yandex said in a statement. Yandex has become the default search engine on Windows Phone-based handsets in Russia. The company has partnered with Nokia, Samsung, HTC and Microsoft to provide its search services on the latest Windows Phone smartphone models on the country's mobile market. Google sites ranked as the top European web property in June 2011 with 338.6 million unique visitors (up 6 percent from a year ago), reaching 91.0 percent of the European Internet audience.